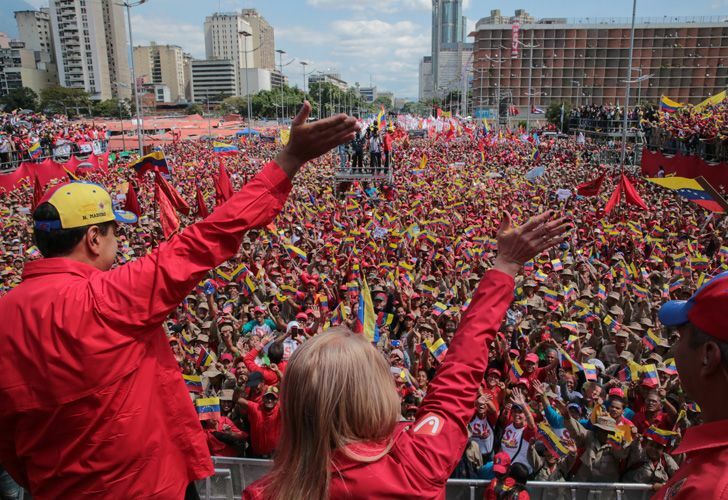 Russia slams 'interference' in Venezuelan politics, as Guaidó calls for a new demonstration on February 12, and another protest to push for the entry of aid. Spain, Britain, France and other EU nations on Monday recognised Venezuela's opposition leader Juan Guaidó as interim president after Nicolás Maduro rejected their ultimatum to call snap presidential elections. Already recognised by the United States, Canada, Australia and several Latin American countries, Guaidó is trying to force the socialist leader from power, aiming to set up a transitional government and hold new presidential elections. After announcing the Spanish government's official recognition of Guaidó, Prime Minister Pedro Sánchez urged the 35-year-old National Assembly head to "call elections as soon as possible, elections that have to be free and democratic." Sánchez said he wanted Spain to spearhead a plan of humanitarian aid for Venezuela in the European Union and United Nations. France, Germany, Portugal, Austria, Sweden, Denmark, Latvia, Lithuania, Finland and the Netherlands also recognised Guaidó. Seven EU states had given Maduro a Sunday deadline to call presidential elections or they would recognise Guaidó. However, President Maduro instead rejected an ultimatum by European countries to call snap elections after opposition leader Juan Guaidó declared himself the Latin American country's legitimate leader. A defiant Maduro said in an interview with Spanish television station Sexta that he would not "cave in to pressure" from those calling for his departure. However, he supported plans for a meeting of Latin American and EU states in a "Contact Group" meeting in Montevideo next Thursday as it could lead to a "dialogue among Venezuelans to resolve our issues." And he called on Guaidó for "face to face" talks, which the younger man has already rejected. Guaidó stunned the world on January 23 when he declared himself acting president at an opposition rally. Taking his authority from the constitution as National Assembly leader, he said Maduro's presidency was "illegitimate" as it was founded on flawed elections. Guaidó is trying to force the socialist leader from power so he can set up a transitional government and hold new presidential elections. "We are going to exercise our powers to deal with the crisis, restore democracy and achieve freedom," Guaidó said Sunday on Twitter. Guaidó says up to 300,000 people are "at risk of death" in Venezuela for want of humanitarian aid. Earlier Sunday, Maduro addressed troops on military exercises in Venezuela's coastal northeast, calling on them for "maximum cohesion" a day after a top Air Force general publicly sided with Guaidó. The opposition "want to deliver the country in pieces to the gringo empire and the local oligarchies," Maduro told the soldiers. Seven European nations, including Britain, France, Germany and Spain, had given Maduro eight days to call elections or they would also back Guaidó from midnight Sunday. "If between now and this evening Mr Maduro does not commit to organizing presidential elections, we will consider that Mr Guaidó is legitimate to organise them in his place," France's European Affairs Minister Nathalie Loiseau told French media on Sunday. Tens of thousands of people turned out Saturday for competing shows of support for Guaidó and for Maduro who was sworn in January 10 to a disputed second six-year term. During the protest, Guaidó announced the installation of collection centers for medicine and food – items lacking in Venezuela – in neighboring Colombia and Brazil. But at his rally on Saturday, he called the opposition "imperialist beggars," claiming a US pledge to deliver $20 million in aid would precede military intervention. Guaidó also called for a new demonstration on February 12, and another protest to push for the entry of aid. Speaking at the European Union's headquarters in the east of the capital, he said this month "should be decisive." All eyes are on the military, which has so far been Maduro's main pillar of support, but there have been signs of unrest in the ranks.